What Do You Want To Know About The 2018 Nissan Titan? Maybe you forgot about it since it seems to fly under the radar, but Nissan makes a half-ton pickup: the Titan. I’m driving one with the 5.6-liter gasoline-fueled V8. There’s all kinds of clever bins and tie-downs that make me wonder why I don’t see more Titans on the road. What would you like to know about it? I’m spending the week in a four-wheel-drive crew cab Titan in the SL trim, which features Barcalounger-esque leather seats, a backseat that can accommodate more full-size humans, cold aircon, fully lined bed with integrated channels for tie-downs, a respectably loud Rockford Fosgate sound system, and a seven-speed automatic transmission. This one has the clever Titan Box package, which has a pair of lockable boxes on each side of the bed that hardly look like boxes at all. They just look like the bed pops in to cover the rear fender wells, but nope: those are boxes, and they’re waterproof in case you’d like to use them as coolers. It’s worth noting that this isn’t the bigger Titan XD, which Nissan’s rep described as maybe a five-eighths-ton truck that fits in between the usual classes as it’s a little bigger. The one I’m driving is just the standard Titan, which is more comparable to your average half-ton F150 or Silverado 1500. Nissan makes this truck in America for the American market, so there’s also more cupholders than a human bladder can plausibly handle. Nissan’s regional press man mentioned that extra-large drinks can wedge in the front console bin where the primary cupholders sit if need be. I winced a little as I’m still scarred for life from the Double Gulp I bought for the Subaru Ascent test. 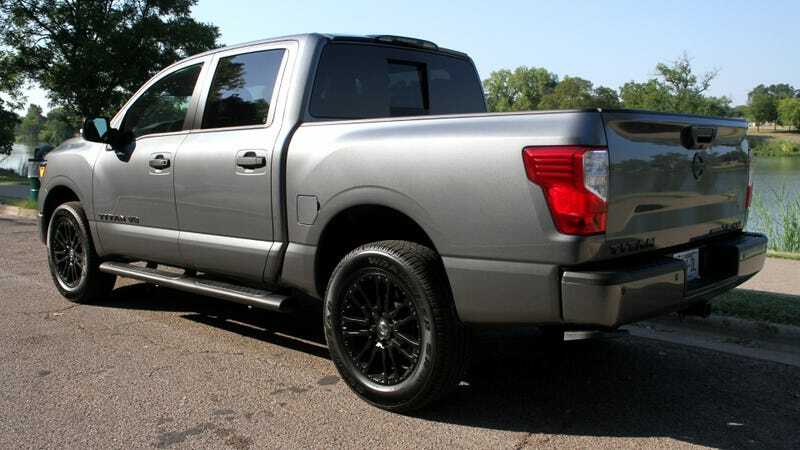 This truck is also the Midnight Edition, with a tasteful package of blacked-out bits, including the grille insert, 20-inch wheels, badges, step rails and fog lamp surrounds. The bumpers and grille surround are also finished in the same exterior color as the rest of the truck. That sounds like it’s bro’d-out on the spec sheet, but in person, it’s actually super tasteful. Are you tired of today’s gaudy huge chrome truck grilles that are designed for boomers who miss their ‘57 Bel Airs and not you? Get the Midnight Edition. So far, I’ve taken it across a large chunk of Texas to see my mom and get some of Dad’s old things that she won’t use, including some tools and a huge desk. The seats are perhaps too squishy for long trips for me, as I was left wanting for support despite there being a rocker switch for the lumbar region. It also has the telltale little bounce as it goes along of a truck that built more for haulin’ stuff than riding empty. Otherwise, it’s a pretty comfy ride. But I’m here to review this for you, and I have it until next Wednesday. What would you like to know about Nissan’s cushy half-tonner? I’ll do my best to find out everything you’d like to know as I’m spending a lot of time behind the wheel.